I can't believe it's been almost a year since I've blogged over here! Truth be told, it's slipped out of the forefront of my life ever since we moved to Virginia Beach. Things have been a bit more hectic here on the mainland, especially since I started doing more work with my job and taking on politically motivated volunteer roles in my community. And, of course, I'll soon have another title to add to my resume -- Mom! Happy New Ye...whoops, I mean February! So it's pretty insane that we're already a whole month into 2016, right?? I'm definitely still adjusting to the new year, especially in writing the date, haha. Time is flying here in Virginia. And I thought our time in Hawaii went by fast -- it's nothing like this! I've been taking on a lot more work, both the paid kind and the volunteer kind, so I know that's the culprit for Mr. L's first year of "retirement" (and nearly our first year in Virginia) slipping through our fingers so quickly. Nothing like some good old-fashioned hard work to make you forget what day of the week it is, let alone that it isn't even 2015 anymore! And speaking of 2015, Mr. L and I were lucky enough to be able to spend Christmas 2015 with our families. The drive back and forth from Virginia to Alabama is rough (not going to lie), but I'm SO glad it's doable in a day. I don't think we'll ever make it a two-day trip again, at least not until kids come along! The pups really do travel well. The first 30 minutes to an hour are always bumpy since they don't know if they're just going to the vet or the groomer (ha! ), but afterwards they settle into their beds and blankets and hang on for the ride. Plus they always let us know when they need to stop, which is actually a blessing. I'm glad they're adapting though! Christmas was wonderful though! We got to have a week's worth of family, friends, and unwinding time and we couldn't have asked for anything more -- well, except maybe more time! (The time it takes to build up civilian vacation is killin' us over here, man. If you or your spouse are still in the military, enjoy that 24/7 leave accumulation while you can!) We do miss Alabama when we have to leave, but I think Virginia's really starting to feel like home, and that's a pretty nice feeling to have. Mr. L and I also made a huge decision in the past few months -- we're officially searching for a home to purchase! I've gone back and forth on feeling euphoric and scared out of my mind when I think about it, and I probably will continue to do so right up until we sign our lives away on those pieces of paper, haha. So if any of you have tips on home-buying, please share! I'd love any bit of advice you could give on the topic. I think one reason why I shift back and forth is because it's difficult to transition to the mindset that we can actually put down roots now. For so long, we expected to be nomads and shift from exotic and awesome place to not-so-exotic and awesome place every three years and we had to put off those dreams of roots for "one day". Well, "one day" is somehow now here and it's certainly intimidating. Mr. L is all ready to jump in though. It's funny how we interpret our same situation so differently sometimes. Maybe some of you can understand how I'm feeling, especially if you and your family have recently separated from the military. It's just...weird. Good, but weird. However, I will absolutely be SO HAPPY to be done with moving! Nine times in six years is WAY TOO MUCH. Anyway, so I guess y'all can consider this your yearly update, lol. Hopefully I'll be back to chat more about the home-buying process, and definitely with pictures!! I'm disappointed at the number of pictures I took in 2015, so I need to change that in 2016. I guess there's my resolution! And now I'll leave y'all with this video of Liam and Lila experiencing snow for the first time in their little lives. Enjoy it, and think about the fact that two days after this was taken, our temperature high nearly topped 70. Virginia weather is bipolar! Hello everyone! I just wanted to check in and let you all know I haven't fallen off the face of the earth...although it may feel like I have! I'm pretty ashamed that I haven't blogged at all for over a month now :( Sometimes life just doesn't give you blogging time though! Things have definitely changed since Mr. L got out of the Navy. We definitely miss the Navy, but we're glad to be out of it too (probably me more than Mr. L though, to be honest). It's easy to still feel connected here in Virginia though thanks to the many, many military bases around us. It isn't the same, but it's a lot better than being isolated from the community entirely like we were in Alabama. Living in Virginia has been a wonderful adventure so far and we are loving our new home. It's taken us a little while to settle in (we've already been here six months!) but now that we can navigate around without the help of Waze, we are really enjoying this part of the state. Being so close to the ocean again is something I didn't realize my soul needed!! It was absolutely the top thing I missed about Hawaii (and still do!) so I'm glad we're near the beach. In the meantime, Mr. L is loving his new job. We weren't sure if he would, but that fact has just made things that much easier for us. If he's happy, I'm happy! And then I've been spending most of my days getting involved with the grassroots campaign of a presidential candidate. I don't really want to go into details about it since I like to keep the blog mostly free of politics (if you follow me on Instagram, though, it isn't that big of a secret! haha), but suffice it to say that I am having a blast holding events, volunteering, and meeting all kinds of wonderful people from around the entire state of Virginia. I'm experiencing a bit of a political awakening and it's very exciting! Beautiful day at Mt. Trashmore today!! One side dish I've been really digging for the past couple of months is couscous. The boxed version is SO easy to prepare and always tastes delicious, plus I love that it's completely done in under 10 minutes! This dish can be prepared in juuuust over that timeframe -- 15 minutes, 20 tops! The secret is to use already prepared chicken. Earlier in the week I'd grilled some chicken breasts for dinner, and I threw a few extra on the grill to have for later. 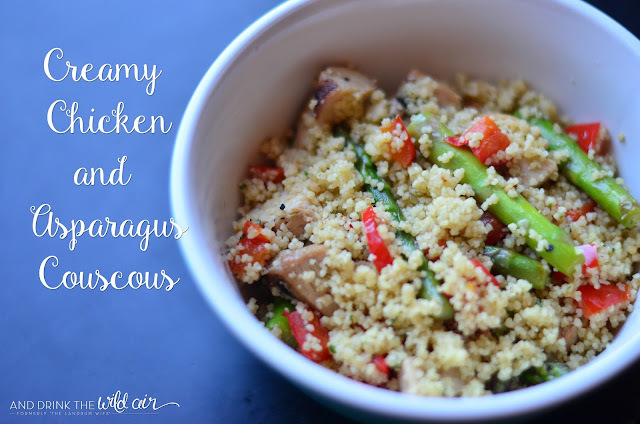 Dishes like this are perfect for that leftover chicken! Mr. L may not share my affinity for couscous most of the time, but as soon as he tasted this dish, he fell in love. He told me I'd better enjoy the bowl I had because he was absolutely taking the rest to work with him for lunch the next day! I couldn't blame him for coveting this dish though. The vegetables were crisp and delicious and the chicken was scrumptious. I loved how the couscous kind of held everything together with its buttery creaminess. Yum!! In a small saucepan, prepare couscous according to package directions. However, instead of adding all water, add equal parts water and half-and-half. Meanwhile, chop asparagus into 2-inch pieces and dice the red bell pepper. Also chop the grilled chicken into 1-inch pieces. Heat the olive oil in a large skillet over medium heat. Add in the chicken, asparagus pieces, and bell pepper and saute for about 2-3 minutes. Then add the minced garlic and saute for another 2-3 minutes. At this point, combine the couscous in the skillet with the chicken and vegetables and also the dried basil. Sprinkle some grated Parmesan cheese over the top and then serve and enjoy! When I was growing up, going to my grandma's house was always a treat. She had a house on acres and acres of wooded, undeveloped land, so there were always plenty of places for my brothers and me to explore and plenty of trouble for us to stumble into! 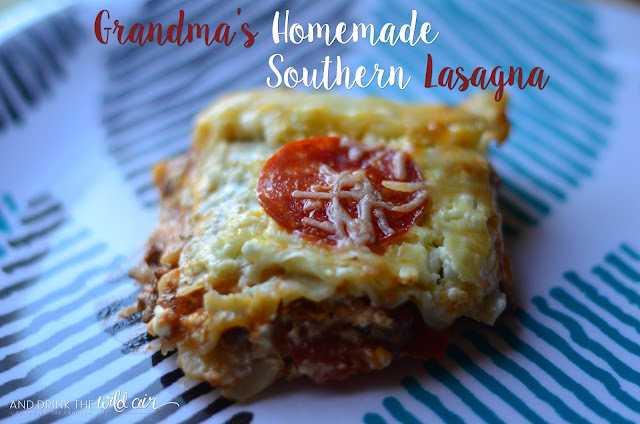 Thankfully by the time we made it back to the house after exhausting ourselves roaming, my mom and my grandma would have something hot and delicious waiting for us at the dinner table, and many times it was this exact recipe! And let me tell you, I loved when it was lasagna night at Grandma's house! This recipe is comfort food at its best. Now, this isn't a typical Italian lasagna -- it's a good old Southern lasagna concoction made with ingredients like cream cheese, sour cream, and pepperoni slices. It's hearty, creamy (obviously! ), and just downright delicious. If you're looking for a filling, yummy, and easy recipe to cook for dinner tonight, this lasagna should rank high on your list. Definitely give it a try and let me know what you think! Cook beef and onions in a large skillet until meat is browned; drain. Add the tomato sauce, tomato paste, water, parsley, Italian seasoning, beef bouillon granules, and garlic powder in with the beef and onions. Cook on low heat for about 10 minutes. In a separate bowl, combine cream cheese, cottage cheese, sour cream, and eggs. Stir well. In the meantime, cook lasagna noodles according to package and then drain. In the bottom of a lightly greased 9x13 baking dish, add a small amount of meat sauce. Then layer noodles, cheese mixture, pepperoni, and mozzarella cheese. Repeat layers starting with the meat sauce, and on the final top layer add the Parmesan cheese. Bake at 350 degrees for 30 to 45 minutes. Then serve and enjoy! 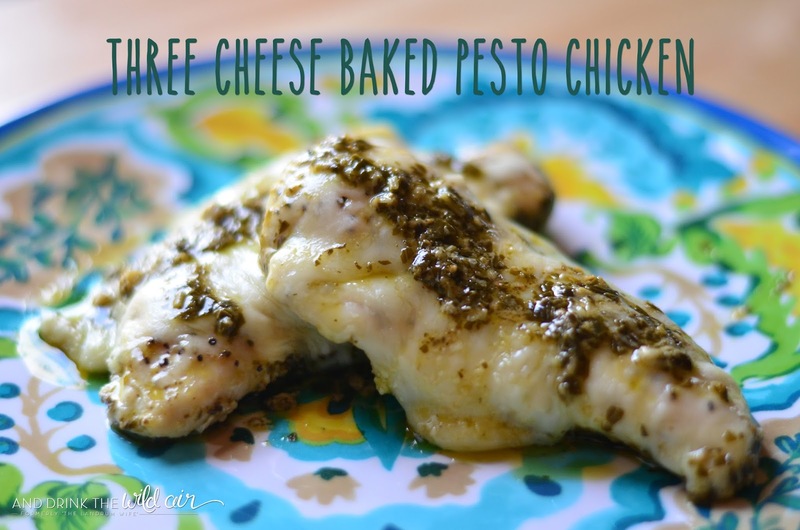 I feel like I've been stumbling across this baked pesto chicken recipe for ages over on Pinterest! It's incredibly popular and I was always intrigued to try it out. I finally made the time to actually have it for dinner a couple of weeks ago when I was meal planning from my Pinterest boards though! I figured I could also kick it up a notch since I had some extra bags of different cheeses in the fridge I needed to use up. Mozzarella was a given since it was already in the original recipe, but I had some Monterey Jack and extra Parmesan on hand, so I figured why not? Who doesn't love extra cheese anyways?! The entire time this chicken was baking, I swear my kitchen smelled incredible. I kept walking out to the living room to ask Mr. L if he could smell it too! He might have rolled his eyes a little at me then, but trust me, when dinnertime rolled around, the only rolling his eyes did was into the back of his head in bliss! This really was a super scrumptious recipe! The pesto combined with the ooey-gooey cheese and juicy chicken really hit it out of the park. 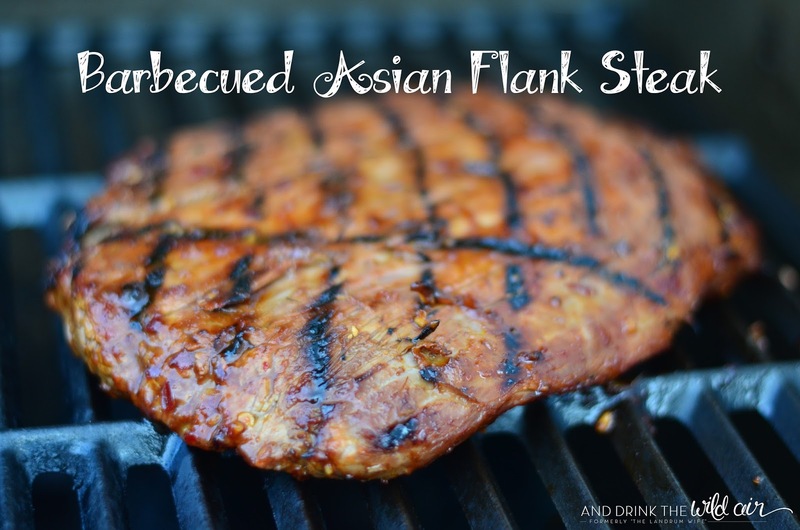 This recipe is totally a keeper and I can't wait to have it again soon! Season each chicken piece with salt and pepper on both sides. In a greased 9x13 baking dish, spread a couple of tablespoons of pesto sauce along the bottom until barely covered. Lay the chicken breasts on top of the pesto and then pour the rest of the pesto over the top of the chicken. Cover the baking dish with aluminum foil and then bake at 375 degrees for 30 minutes until the chicken is barely cooked through. Pull the chicken out of the oven and remove the foil. Then sprinkle the Monterey Jack, Mozzarella, and Parmesan cheeses on top and put back in the oven for another five minutes. Then serve and enjoy! Mr. L and I don't normally eat flank steak that often. It's a cut of meat we didn't really grow up on so we weren't really that used to it! But lately we've been attempting to break out of our box every now and then, so I picked up a couple of pounds at the grocery store a while back and decided to grill it up. Thanks to Allrecipes, I came across the perfect recipe! It sounded delicious, so I couldn't wait to give it a shot. The ingredients list seemed to be bursting with flavor, from the grated ginger root to the chili and fish sauces. Thankfully it turned out to be a winner! I did make a few tweaks in the ingredients as well as the cooking time since Mr. L and I both prefer a more "done" steak. If you prefer more rare, shoot for around 5 minutes per side cooking time. Personally, I found the 7 minute mark to be great for us. In a medium-sized bowl, combine first five ingredients. Reserve about 1/4 of the mixture to brush on the meat while grilling. Score the flank steak in a diamond pattern and place either in a shallow baking dish or one or two gallon-sized Ziploc bags. Pour the rest of the marinade over the steak, making sure it is fully covered. Cover and marinate in the refrigerator for at least three hours. Preheat grill to high heat, then brush on a light layer of oil. Grill the steaks for about 6-7 minutes per side, depending on desired doneness. Be sure to brush the reserved marinade on the steaks frequently. Let the meat rest for about 5-10 minutes, then slice, serve, and enjoy!